Maybe this is just your average all-pervasive dukkha and doesn’t merit additional attention. But it also seems to me as part of the story I want to tell and provides some context. After writing and rewriting and rewriting this post, the results don’t seem to speak for themselves. It has information, but it’s difficult for me to recognize the result. It’s as if it’s an arm’s length away when it should be touching my skin beneath my clothes. This is a pretty common state of affairs for me. After my brain injury I didn’t lose knowledge, I lost fluency. I am an aphasiac. More broadly, my brain has problems processing and expressing information from every sense just as it has processing and expressing language . Within a narrow range, things are just fine, but this general bottleneck of information produces frequent cognitive overloads. For the first few years I didn’t get any treatment because I had no diagnosis. No diagnosis, no treatment. In pursuit of some kind of answer to the question, “what happened to me?” I saw, over 3 years, 5 neurologists, 2 neuro-psychologists, 2 psychiatrists, a neurosurgeon, an acupuncturist, a shaman and a homeopath. It was the fifth neurologist teamed up with the second psychiatrist who finally diagnosed my brain injury as the result of viral encephalitis. Dr O. said she was surprised that I was as functional as I was – that I had done a good job with my auto-rehab, but that further progress was unlikely. Finally getting a diagnosis made both Karen, my wife, and me, giddy with relief. Sure the news was not great, but this meant I wasn’t crazy, I wasn’t making it up. And in broad strokes, she was right. My overall bandwidth is pretty much what it was then. That perhaps I have grown as a person, that Karen and I have uncovered, developed, adaptations to various difficulties doesn’t really affect that. So, some things yield to stick-to-it-ness, and some don’t. (If, as I note in The Photography Paradox, “The decisive moment require[s] too many decisions” it just isn’t going to work.) One of the things that until recently didn’t yield, is playing music. Listening to music for me varies on a limited continuum. At one end it’s as if everyone is speaking a foreign language I only barely understand. It then moves to irritating noise, followed by real discomfort and finally, cognitive collapse. Pre BI, I was a reasonably good guitarist. Post BI not so much. I could play in short bursts, but it would quickly lead to cognitive overload. So, every year of so I’d give it a shot just to see. Every year of so I’d have the same result. Unsatisfactoryness. This past summer I decided to try a more sustained, gradual approach. 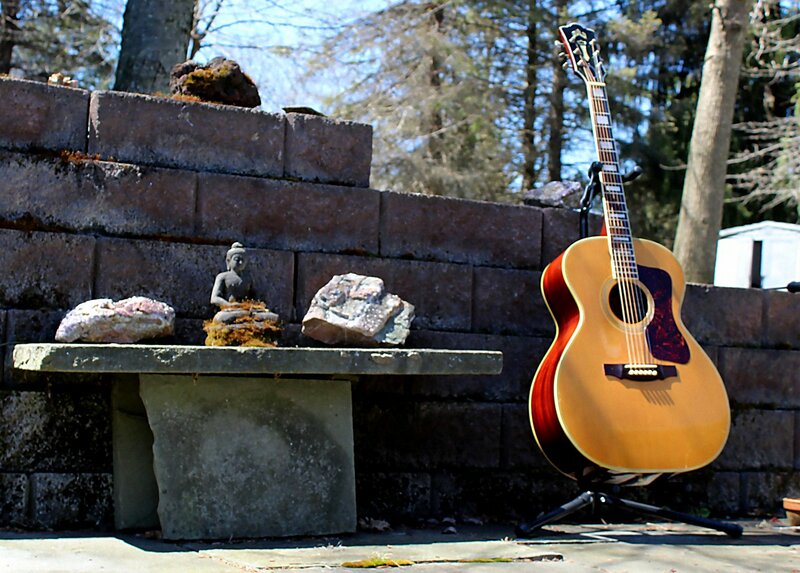 Most days I would take my guitar out on the patio and play for a bit. Some days for several minutes, some days a chord or two would be all I could manage. I wouldn’t measure the time. I just played until I could feel the cognitive distress starting to build and then I’d stop. After a while, some of the time, it was even enjoyable. After a while more, I found I was looking for a sound my faithful acoustic just couldn’t deliver. I guess I was hearing my first real guitar – an electric. When we were, I guess 12 or so, my friends and I decided we wanted to start a band, but only one of us knew how to play an instrument – the drums. After I proved I was serious with a learner guitar, my parents bought me an electric, but no amp. My dad wouldn’t allow it – too much noise. After a couple of years, the band broke up (I was the mysterious one). Then the local Up With People I played with went bust (I was Morally Re-Armed – even though UWP had just broken off from Moral Rearmament, my chapter was still handing out copies of None Dare Call It Treason to cast members.) I wanted to hear what I was playing, so I traded the electric my parents bought me for an acoustic. Oddly, my parents were horrified. Sure I took a beating from the guitar shop on the no-cash trade, but that wasn’t it – my parents really liked the idea of me having an electric guitar. 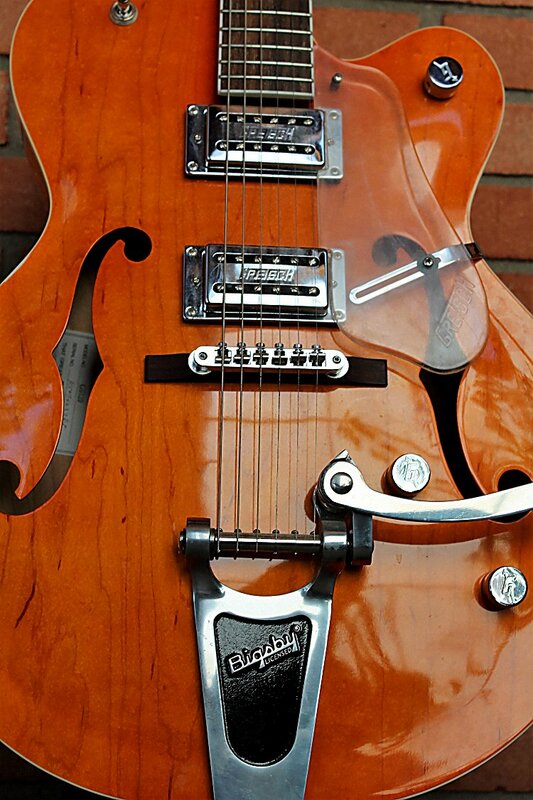 I used the money from my first summer job to upgrade to a 1968 Guild F47 (John Lennon played one on I’m Only Sleeping from Revolver.) . Over the years, the guitar’s nameplate had delaminated from the headstock. With all this playing, it needed to be repaired. So one August Saturday, Karen and I went to our local Guitar Center. I saw it right away – a used hollow-body Gretsch completely the lighter color of a traditional sunburst finish. No darkening toward the edges. I gave it a try, and it was like, well, it was satisfactory, as satisfactory as anything I’ve done with my pants on since that mosquito swarm, the ensuing flu-like symptoms and the temporary paralysis in 1994. The little tube driven amp I tried it out on, looking just like the amps my friends had in our erstwhile garage band, worked just fine, so I got one of those too. Karen paid for it all as I watched, a bit stunned with the rapidity of the whole thing. We were back home 45 minutes after we had left the house. Since then I’ve been playing somewhat in fits and starts. If anything else substantial is going on, I don’t have the juice for it. So I’m still mostly going over old ground, my dexterity isn’t what it used to be, but gosh darn it, it’s fun. Somehow going electric makes it easier to tolerate the cognitive load than playing the acoustic. I guess there’s an element of playing the amp rather than the guitar going on and somehow this short circuits my short circuits. I think the touch of high gain I like helps too. But really, I have no idea what I’m experiencing when I’m playing. It’s not that I’m in some altered state, or even in Csikszentmihályi’s flow state. (My focus for instance may not be particularly good). I just don’t know. None of this seems to have had any impact on the experience of listening to music for me. It’s still cognitively perilous, and has at best, a de-personalized quality to it. Anyway, Karen got me recording software and a good microphone. So here’s a bit of what I play. To me, it’s just another recording of music that’s hard to listen to. So please, enjoy it, for me. Really enjoyed the piece and the piece. You are fabulous Bob! Your music has the feel of soulfulness and joy.